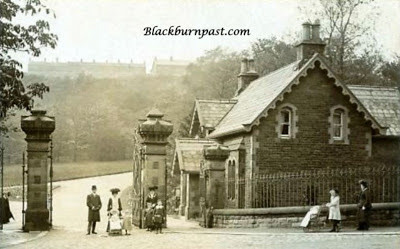 I think I've a few pictures of the West Park Lodge on here, but this is probably the first of the East Park Lodge. The rooftops at the top of the park, will be the houses and cottages on Revidge Rd and that gap between them is probably where the path that led up to the 'Tank' is. Uncertain of the date of this photo, but the attire looks very Edwardian. Does anyone remember in the late 80s when Corporation Park's large lake was drained due to a WW2 bomb being discovered? I remember it vividly since we used to walk past it weekly and used to be in awe at the sight of it being emptied and the amazing depth of it! I would love to see any photos of the emptied lake but have been unable to find anything online! I remember reading about it in the Evening Telegraph at the time Stephen, but I never got around to going up to take a look. I don't know of any photos, but I'm sure there will be some out there. The Telegraph might have some in their archives.